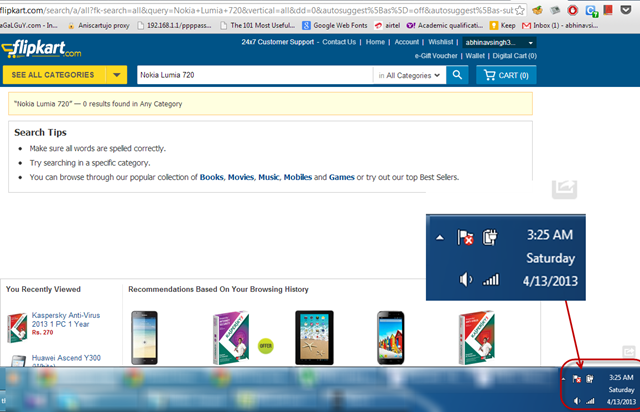 We have been seeing many of the websites reporting about the pre-order of Nokia Lumia 720 at price of 18,500 INR but when I visited Flipkart to check out this phone, then it display no results and I have pasted the screenshot of the same below. Moreover, when I tried to reach to that pre-order page of Nokia Lumia 720, we are getting redirected to Flipkart home page. This phone was launched at MWC 2013 and you can have a look at its Hands on Images right here. With the screen size of 4.3 inches, 1GHz processor and 512 MB RAM it becomes a decent combo for the hardware to handle Windows Phone 8 without any lag and offer the users with a great experience. Moreover it is one of the few phones with Windows Phone 8 OS which will be available in the market and that is the reasons users are comprehensively looking forward to its release. Due to this reason, the release of pre-order over the Flipkart made a breaking news but fonearena reported that they have not mentioned anything regarding the release of the product. So, it can be of the many possible reasons due to which the pre-order of Flipkart for Nokia Lumia 720 has been down. We will keep you updated regarding any info related to it. Tell then keep search about the product on Flipkart and let us if you can find anything on Facebook related to it.